I heard about a family who was caught in a disaster without any lighting. They had put solar lights on their walkway up to their front door. The person writing the article said they were inside in the pitch black and there was a glow of light coming in their living room window - when they investigated it was their solar lights. They promptly brought them in their house and used them until their lights came back on. It had crossed my mind to use my outdoor solar lights, but I hadn't ever tried them. So after reading this, I turned off my lights and retrieved some of them. They aren't as bright as a lantern or a candle, but they would be a wonderful thing to have as a back up when your other resources were spent. The light isn't really bright but you can see where you are going especially if otherwise it is pitch black! I have seen a few sales on them with the spring gardening items, so it would be a good time to invest n them. You can even use them to help with lighting outside right now! I have solar lights that are 5 years old and still shining bright at night. Outdoor solar lights uses the identical action to generate power as the solar panels on your ceiling (or that you could set up on your ceiling, if you selected to). Essentially, it applies photovoltaic (PV) cells, which accumulate and switch solar energy into electrical energy. The PV cells apply semiconducting materials to engage the sun’s light, which interacts with the silicon and another components to produce electrical energy. The electrical energy runs over cables which power the battery, which in go powers the light. This is an highly simple explanation, but it will present you the common idea of how solar cells play. They can only make electrical energy from direct sunshine, which is why solar lighting wants a battery in order to be able to light up the dark. So that the batteries to keep a constant charge, the solar light fixture should be in a position that meets full sunshine for almost of the daylight. If it just gets partial sunlight, because it’s barred by trees or other construction, or because your area has much of cloudy conditions, the batteries will run out earlier, and your fixture will supply light for a lower amount of time. 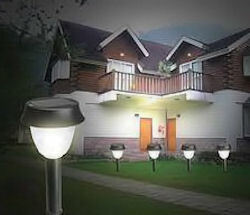 Most outdoor solar lights fixtures own a backup power system which applies rechargeable batteries. Solar lights fixtures which apply a small amount of electrical energy frequently apply small AA Ni-Cad or NiMh batteries. But more strong solar lights fixtures (like head lights) apply a covered lead acid battery. Photo detectors that automatically evaluate light degrees (like the kind that tells your photographic camera when to apply its flash) are constructed into the solar lights fixtures. They monitor light degrees and turn the fixture off at morning and on at nightfall. But get sure there are no artificial light sources (like a street lights or head light) that may contribute a wrong reading and forbid the light from turning on.